Hotel Bella Donna is like a friend that is near whenever you need help. The promptness and high quality of our services are the business card of the Hotel Bella Donna one of the best eastern. 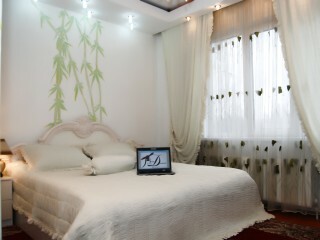 Hotel Bella Donna is a good choise if you search a cozy and cheap hotel in Chisinau Moldova. In Hotel Bella Donna *** you can acommodate in one of 15 rooms or rent a house, villas. You will appreciate our comfortable rooms and Our low prices. Special programs, including car rental, airport transfer, travel anywhere in Moldova, Moldovan Wine Tours, Restaurants, conference rooms and hotel rooms. Reserve a car in the car rental Hotel Bella Donna Kishinev, this is the best choice for travel in Chisinau and Moldova. Excellent service at discounted prices. Hotel staff will help to solve any problem and always will be happy to welcome you. Single Room Air conditioning Satellite TV Refrigerator Minibar Work-desk Bathroom-Shower Bathrobe Hair dryer Slippers chamber Wake-up service Double bed Breakfast is included in room rate. Double Room Air conditioning , Satellite TV, Refrigerator, Minibar, Work-desk, Bathroom-Shower, Bathrobe, Hair dryer, WC, Slippers chamber, Wake-up service, Double bed-king size. Breakfast is included in room rate. Twin: Air conditioning , Satellite TV, Refrigerator, Minibar, Work-desk, Bathroom-Shower, Bathrobe, Hair dryer, WC, Slippers chamber, Wake-up service, 2 beds. Breakfast is included in room rate. Suite: Air conditioning , Satellite TV, Refrigerator, Minibar, Work-desk, Bathroom-Shower, Bathrobe, Hair dryer, WC, Slippers chamber, Wake-up service, Double bed, Jacuzzi. Breakfast is included in room rate. It is within 0. 5 kilometers away from Railway Station. Nearest airport: It is within 0.5 kilometers away from 5 km from Chisinau airport .